In 976 a young boy, Umewaka, wandered off from his family and was captured by a slave trader who brought him to the area of what eventually became the Mukojima section of Edo. The boy died there from exhaustion and sickness. Later a wandering priest built a mound in memory of the boy. In time the Mokuboji temple compound was built there. The mound still exists today and every year a memorial service for the boy is held there on April 15. "In Kiyochika's landscapes, Shinto shrines often convey moods of isolation. Umewaka Shrine, for example, was located far beyond the settled limits of the city, close by the east bank of the Sumida and well north of Hashiba ferry... it was dedicated to the memory of a kidnapped child who died here centuries before and whose story was perpetuated in the Nō play 'Sumidagawa.' 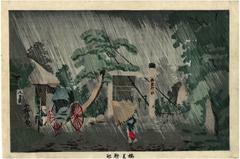 The driving rain heightens the sense of isolation, as a woman tucked beneath an umbrella, her red undergarment... makes her way over the puddled earth; to the left a jinrikisha sits empty before a hut in which its puller crouches to wait out the rain." Quoted from: Kiyochika: Artist of Meiji Japan by Henry D. Smith II, Santa Barbara Museum of Art, 1988, p. 43. In Color Woodcut International: Japan, Britain, and America in the Early Twentieth Century by Christine Javid of the Chazen Museum of Art it says on page 15: "In his nocturnal townscapes as well as his scenes of isolated Shinto shrines like Kiyochika embraces the mystery or at least the remoteness felt in those places most redolent of the past." 1) in color in 原色浮世絵大百科事典 (Genshoku Ukiyoe Daihyakka Jiten), vol. 9, p. 94. 2) in a small black and white image in The Edward Burr van Vleck Collection of Japanese Prints, p. 229. There is another copy of this print in the collection of the San Diego Museum of Art.